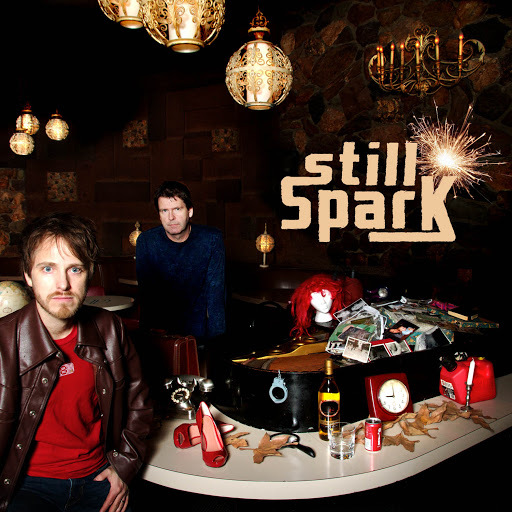 Song of the day: Still Spark – "Love Comes Calling"
I was contacted a few days by the lovely Sarah (Hi, Sarah!) about a band she wanted me to hear. As you may (or may not) know, when it comes to new music I’m definitely a “Can do” kind of guy, so taking up Sarah’s suggestion was what people in the land of Americans like to say a “no-brainer”. The band is called Still Spark, and they’re from the US. Before we get to the music, though, I just want to mention the band’s biography. Fueled by a successful Kickstarter campaign, the self-titled debut album from the Los Angeles-based duo will be released on March 8, 2011. It was produced by Kay Hanley (Letters to Cleo, Palmdale, Miley Cyrus) and Chris Zerby (Helicopter Helicopter, Hello Dragon) and boasts knockout performances by Michael Eisenstein (Letters to Cleo, Our Lady Peace), Blair Sinta (Melissa Etheridge, Alanis Morrissette), Lawrence Katz (Mighty Mighty Bosstones), Joseph Karnes (Five for Fighting, Damien Rice), Linus Dotson (Nerf Herder, Palmdale), Gaby Moreno, and more. A collaborative effort in every sense, Still Spark whips together roots rock, pop hooks and clever wordsmithing, proving that sometimes two heads, or two guitars – when nobody would have bet on them – can create something bigger than the sum of the notes. Seth Freeman and Dan O’Leary were two goat-herders who lived on opposite sides of the world. Seth was based in Venezuela and Dan divided his time between Tibet and Portugal. They met at the 1967 Annual Goat-Herders’ Convention in Gdansk. It was in the foyer of Gdansk’s Bumpey-Frisson Hotel where the Convention was being held that Seth’s main goat accidentally bumped into Dan’s. As the two men exchanged apologies and greetings, they discovered that in addition to goat-herding they shared a love of dirigibles, paintings of giant acorns, and, most importantly, the size of f-holes in pre-Edwardian lap-steel guitars. When Seth invited Dan back to the hotel room he was sharing with his main goat to show Dan his collection of f-holes, they decided to have a whistling contest. After a few hours of whistling they concluded that neither man was better than the other. In fact, their whistling complemented each other’s to such an extent that they both came up with the same idea at the same time: how about they try to write songs together? They were so excited at the prospect that they immediately set about writing a song. Unfortunately, neither knew how to play guitar – and neither had a guitar. They ran to the nearest music store, purchased guitars and a book on learning how to play, then ran back to the hotel room. The Convention finished in three days but Seth and Dan stayed on, determined to master their new instruments. After two weeks in the hotel, Seth and Dan had learned 5,241 guitar chords. For Seth and Dan, this was now the moment to see if their hard work would pay off. They endeavoured to write their first song together. This they did, and they were relieved that the songwriting process for them turned out to be very easy. Their first song was a masterpiece. They had written a 23-minute song about the joys of goat-herding, and it had only taken them two minutes to write. Buoyed by their new-found talent, they proceeded to write an album’s worth of songs. They did this in the next 14 minutes. And the result is their debut album (minus the 23-minute song about goat-herding which was left off due to time restrictions). To give the album a name, they both decided against Seth’s suggestion, Seth And Dan’s Really Good First Album, and Dan’s suggestion, Dan And Seth Made An Album – Please Listen To It. The two finally settled on Still Spark (“Still” is the name of Seth’s main goat, and “Spark” is the name of Dan’s). As for the name of the duo, they chose “Seth And Dan Or Dan And Seth”. Unfortunately, the two discovered that there was already a duo from Finland called “Seth And Dan Or Dan And Seth”. Undaunted, they thought it best to simply use the name of the album for the band name. When all this had been finalised, Seth and Dan sold their respective goat-herding businesses and based themselves in South Korea, which is where they built up a music empire involving songwriting and music production. Their South Korean music publishing company, “SKit’ll Do You Good” is now the second-largest company in the third-smallest town in the fourth-Eastern area of the country. Their activities have now expanded to include writing and producing the music for all of South Korea’s boy bands, in addition to choreographing their dance moves and designing their costumes. Seth and Dan have come a long way from their simple, goat-herding days. As for the music, to my (faulty) ears it’s pop/rock music that sounds very slightly rootsy. And although I haven’t listened to a lot of Dwight-Twilley Band over the years, I reckon Still Spark sounds a bit like them, too. My friend and fellow Australian music blogger Stonefish (Hi, Stonepacked!) was also contacted by the lovely Sarah, and the Stonester blogged about Still Spark a couple of days ago. To me, the bad news is that you may not want to read about Still Spark for a second time, which has the unfortunate side-effect of depriving Stoney of a potential reader. However, because I’m an incurable optimist I think the good news is that you have a chance to read someone else’s thoughts on Still Spark (with the bonus of those thoughts being eminently more understandable). You are currently browsing the archives for the Still Spark category.